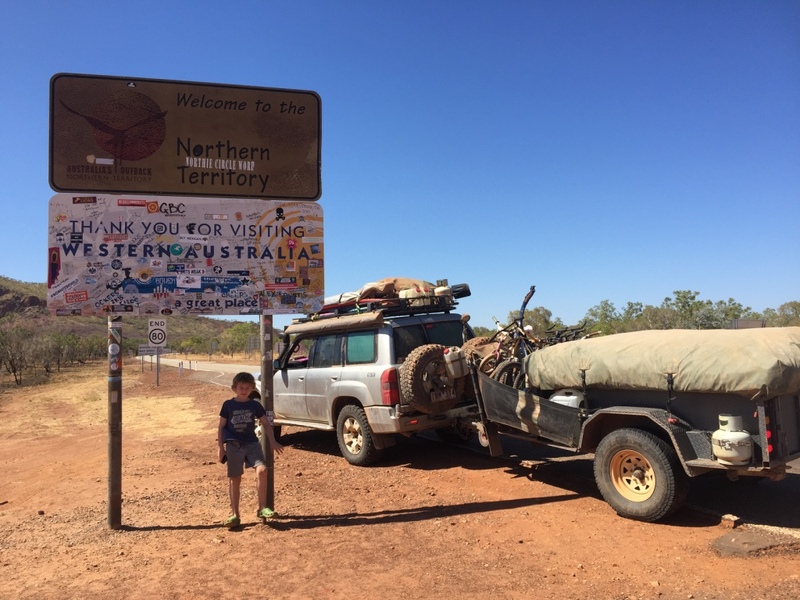 Leaving Lake Argyle we headed east and cross the border into the Northern Territory. We were a bit sad to be leaving the beautiful state of W.A. after an amazing four months on the road. The sign post into the N.T. 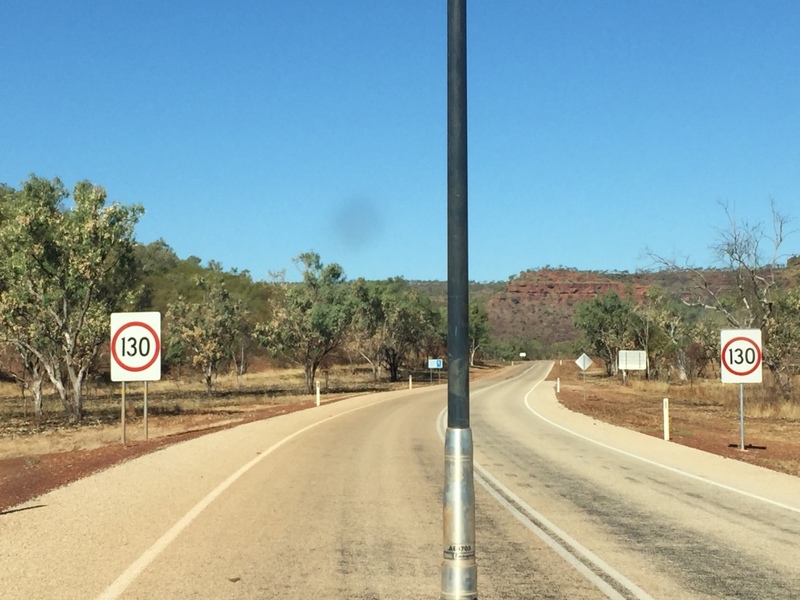 was not inspiring and the next sign set the speed limit at 130km per hour but with a trailer the Patrol was not in any risk of exceeding that speed limit. 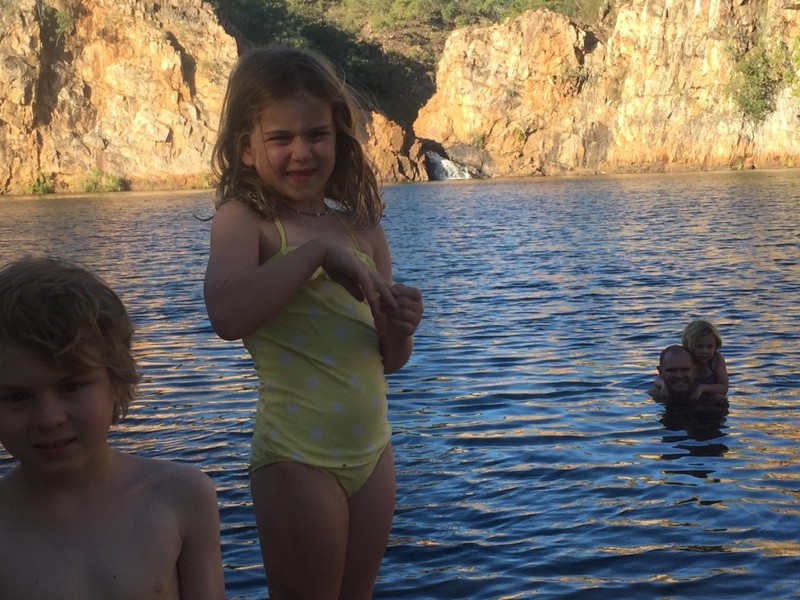 We had a huge day driving to reach Katherine Gorge at Nitmiluk National Park we arrived at dusk and whilst looking for a campsite we found a site that coincidently was next to our neighbours from Lake Argyle. ( we felt like stalkers but they said we could camp next door again). The children were all very excited to see their little friends again. After a late dinner it took them a while to settle down and it felt really late due to the change in time zones and put our clock an hour and a half forward. 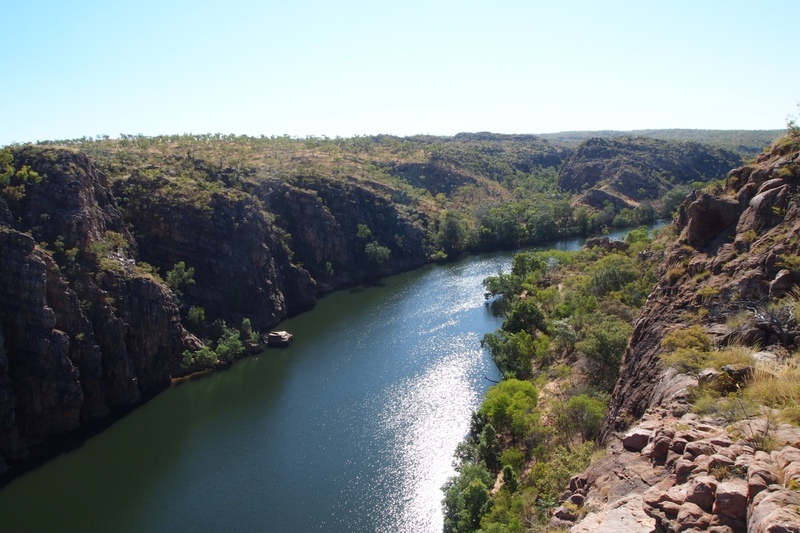 The next day we set off for the Katherine Gorge look out walk which offered a view down the gorge and across the Katherine River. 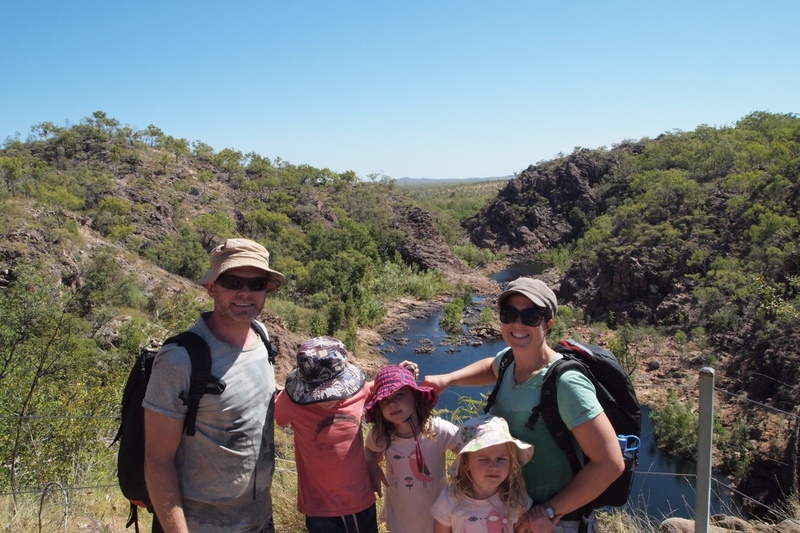 There are several gorges within this national park but the walks to the ‘croc safe’ gorges open for swimming were all outside of our walking range (about 9km) and the kids were a bit over long walks. 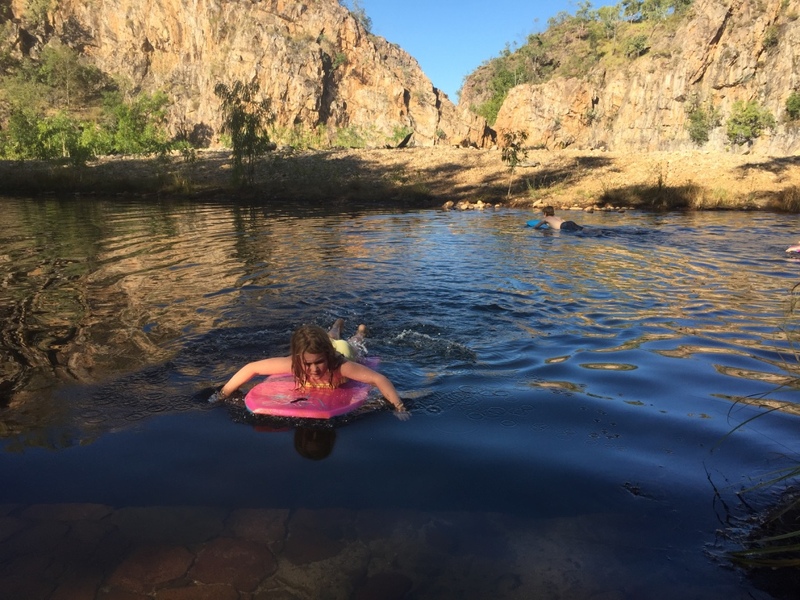 Canoes were an option but the water was deemed unsafe for swimming but safe for canoes? 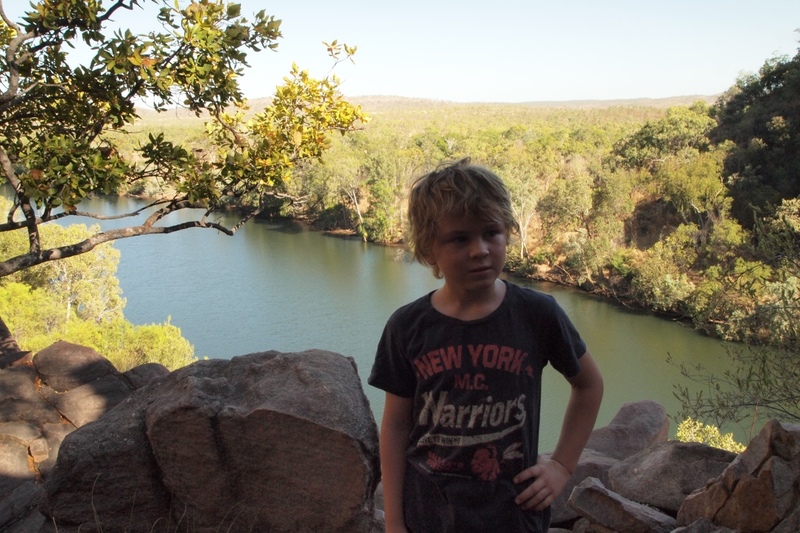 We enjoyed the short steep 1.2km walk with our friends and the view was pretty…then we headed back to the interpretation centre and the children read up a bit about the Jawoyn Traditional Owners and their culture. 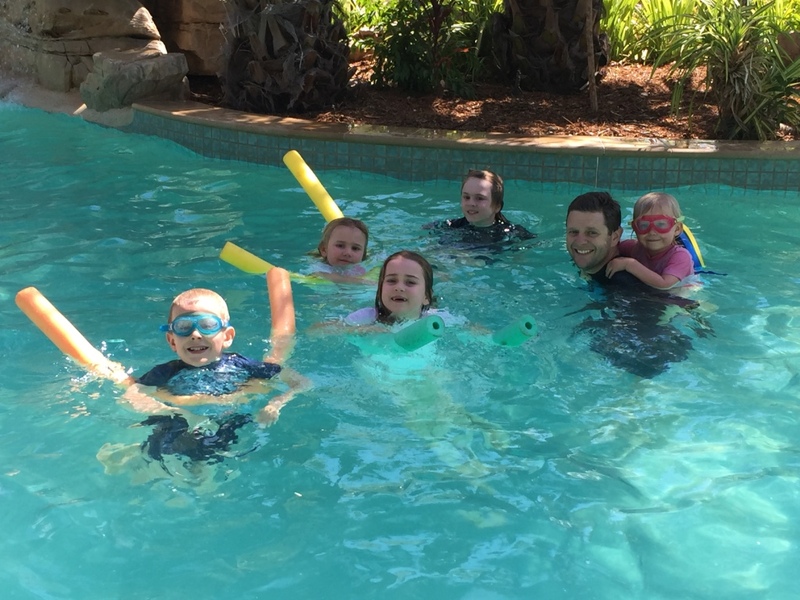 It was another beautiful day and the children were keen to try out the camp ground pool. They had a lovely afternoon by the pool and running around playing on a patch of green grass next to the pool area…we have not seen very much grass in last few months. 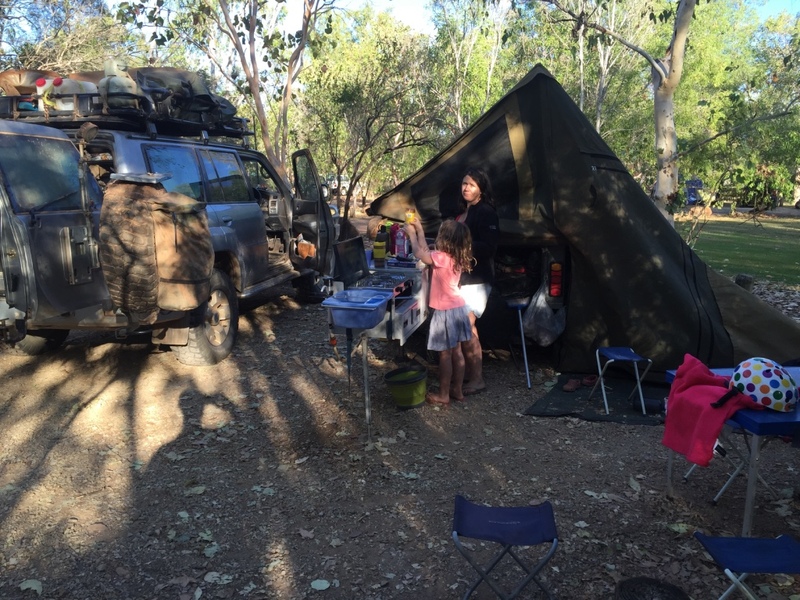 The grass did not extend into the camp ground at Katherine Gorge….this was black dirt. 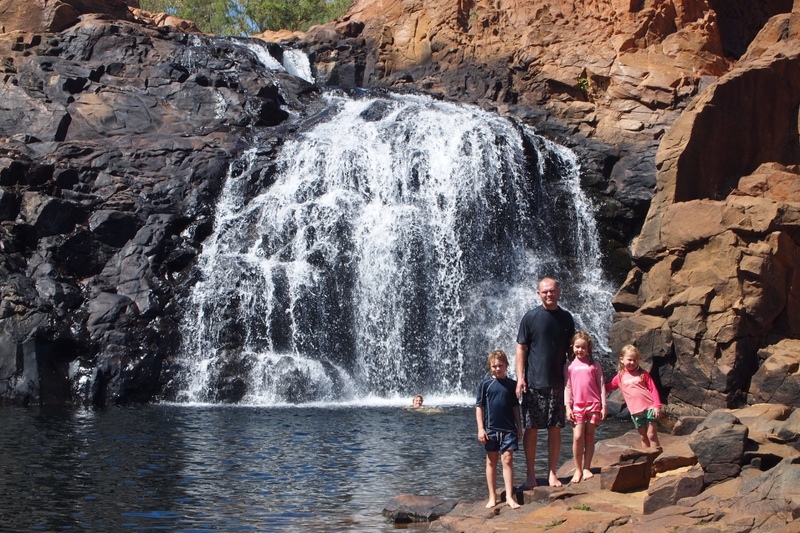 After our second night we headed to Leliyn (Edith Falls) the other part of the Nitmulik N. P. and in contrast to the Katherine Gorge the campsites at Leliyn were surrounded by grass and trees providing lovely shady camping and the a freshwater swimming plunge pool at the bottom of the waterfalls falls only 150m from the camp ground. 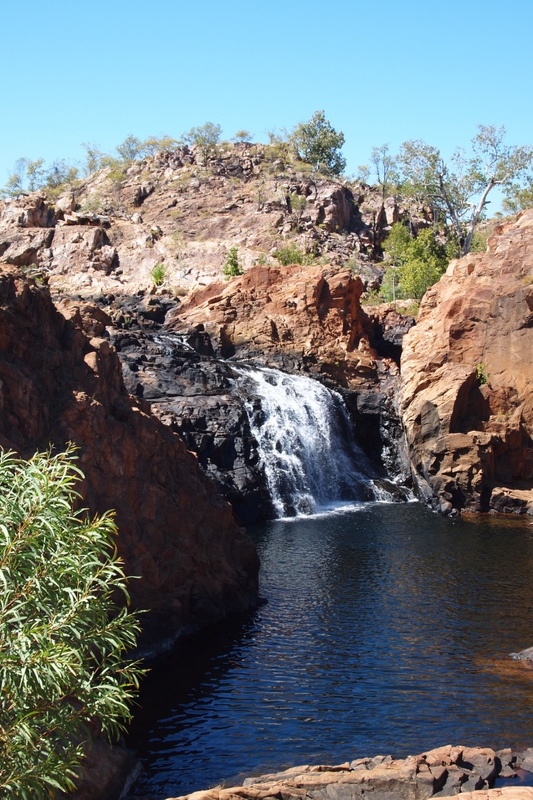 Edith Falls camp grassy and shady. 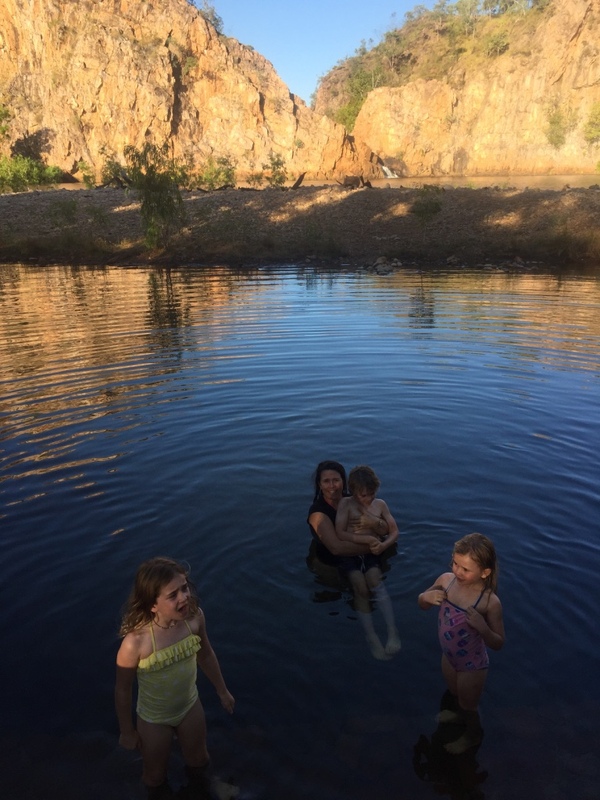 Initially we though we would only stay a night and leave after the visiting the Sweetwater Falls but when we discovered it was a long weekend we decided to stay for three nights to celebrate Andrew’s birthday and avoid a long weekend crowds. 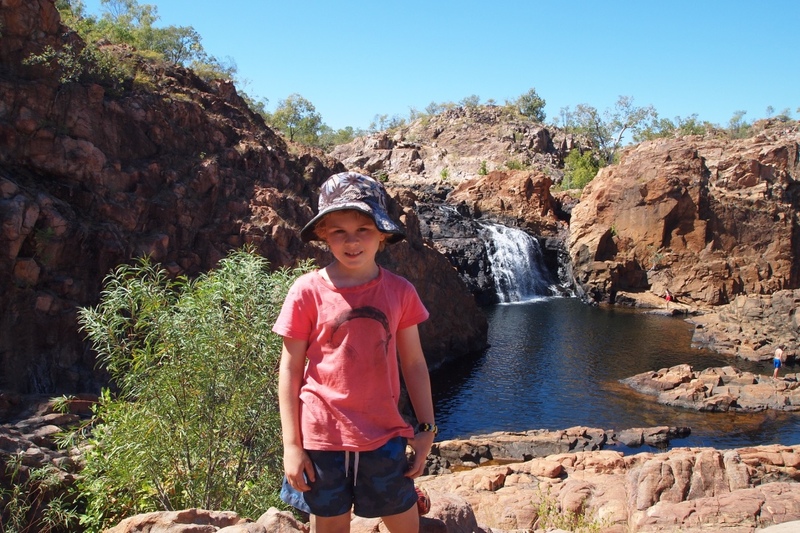 Our second day at Leliyn we headed up the short 900m walk to the Sweetwater Falls and enjoyed exploring around the pools. 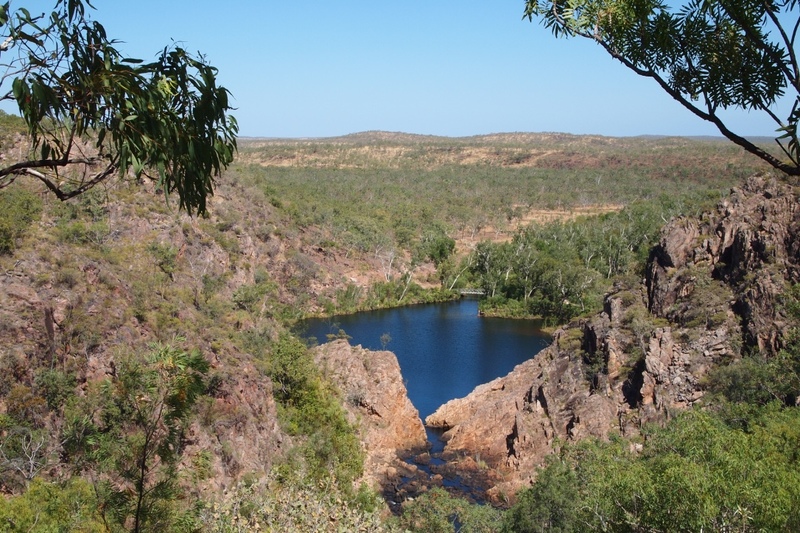 We then walked along the return loop back to camp only a kilometre but in the heat it was a hot return journey over the hill and back to camp. 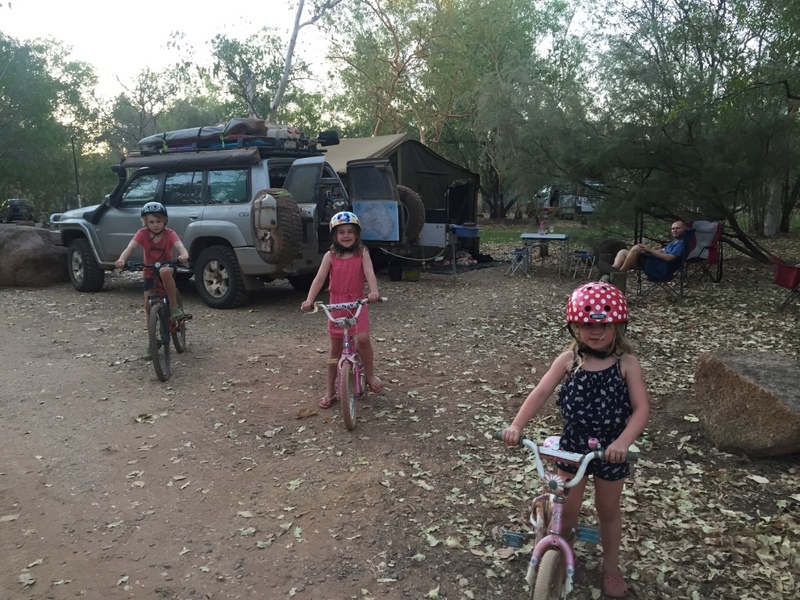 We took the bikes off after deciding to stay and campsite had a great loop for the kids to ride. Aaron and Holly took turns riding with Bianca who is almost keeping up. 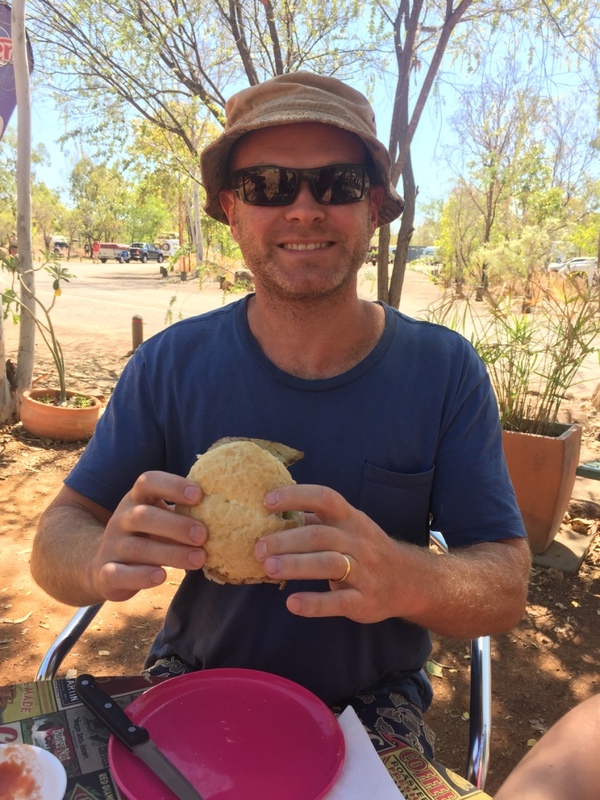 The next day was Andrew’s birthday and we celebrated with a relaxing day in camp with Barra Burgers for Lunch at the Leilyn Falls Café. 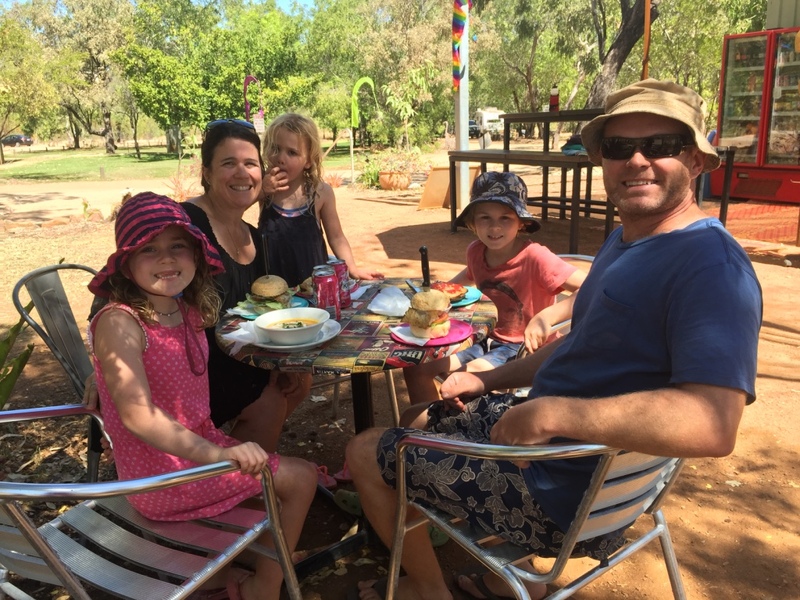 This camp ground was a favourite for everyone – nice bushy camps, no generators allowed, swimming a short stroll away it was hard to pack up and leave but we are starting to feel that there is too much to do and see and we are running out of time! We love tracking your post and hearing what you have been up to. 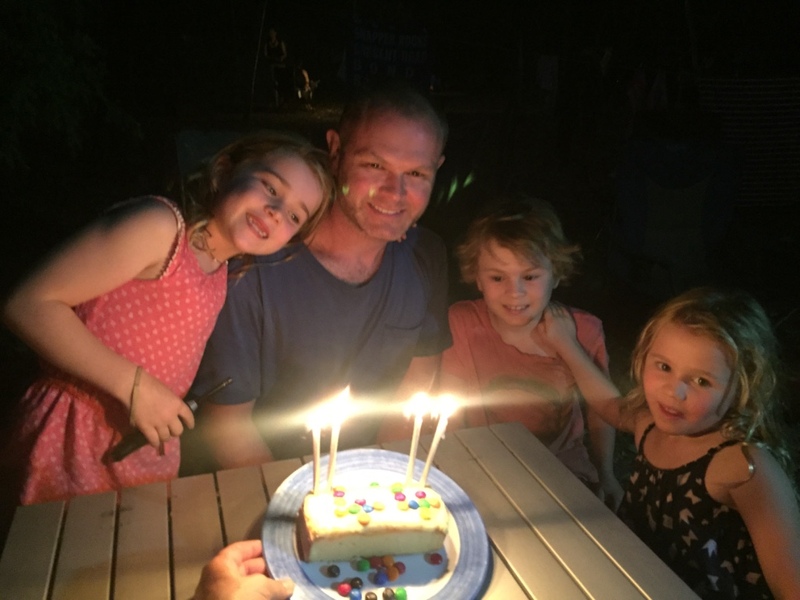 We are looking forward to when you return to school to tell us more about your adventures.